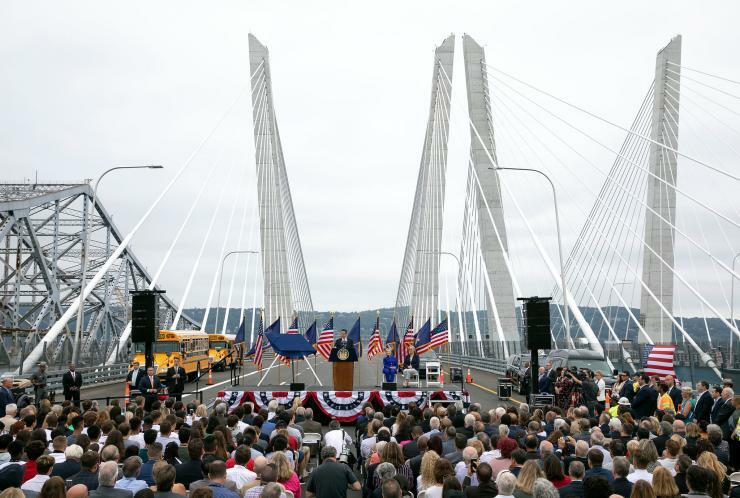 The opening ceremony has been held for the second of the twin cable-stayed structures replacing the Tappan Zee Bridge in New York, USA. However, the actual opening to traffic has been delayed a few days amid concerns about the stability of a section of the adjacent existing bridge, which is being demolished. The new crossing is now set to be open on 11 September. The US$3.98bn project to construct the 5km bridge - the first cable-stayed bridge across the Hudson River - and its ancillary facilities, is one of the largest in the United States and the biggest in the history of the New York State Thruway Authority. The bridge features eight 128m towers standing at a five-degree angle. Approximately 7,000 workers have been involved in the project, spending nearly 11.5 million work hours on it. The structure, which was formerly known as the New NY Bridge, is now called the Governor Mario M Cuomo Bridge, after the current governor Andrew Cuomo’s father. It has been built by Tappan Zee Constructors, made up of Fluor, American Bridge, Traylor Bros and Granite. The designers are HDR, Cowi, URS and GZA.